Titanic Triceps In 5 Simple Steps: Progress Has Never Been So Good! Underdeveloped triceps can ruin the look of someone's 'guns' and can halt progress. Don't be like everyone else who gets caught in that trap. Instead, follow these 5 simple steps to build your own titanic triceps! Generally speaking, triceps end up being an afterthought in most people's training. 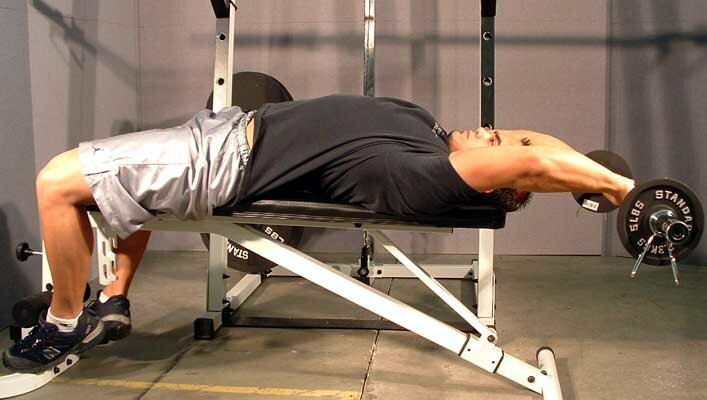 The common trend in the gym is to start out a workout routine with the bench press and then maybe include a triceps exercise at the end of the routine. The issue with this is that proper attention is not given to the triceps muscles and they may hold back progress in the gym. Overall, the triceps are probably the most important muscle in terms of upper body training in the gym. Biceps would be right up there as well. Strong triceps are necessary for every pushing movement and some pulling movements as well where the arms are close to the body during the movement. If a given individual has weak triceps, then it will be very hard for them to effectively train their shoulders, chest, and lats. Their triceps will end up doing most of the work in movements like bench presses, military presses, and rows. The end result is that the intended muscle group that is being trained is not being pushed hard enough, and results in the gym will grind to a halt. Triceps are also important for building a set of "guns" for arms. A common myth is that big arms are created through building monster biceps through biceps' curls. However, the truth is that most of your arm is actually composed of triceps rather than biceps. While the details of exactly how much of your arms are comprised of triceps can vary from person to person, it is a fact that about two thirds to three fourths of a typical arm are composed of triceps. Underdeveloped triceps can ruin the look of someone's "guns" and can halt overall progress in the gym. Don't be like everyone else who gets caught in that trap. Instead, follow these 5 simple steps to build your own set of titanic triceps. The priority principle essentially translates into a simple concept: train the body part that needs the most attention first and focus all of your energy on building that body part first. 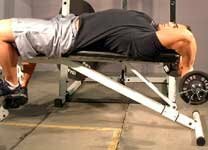 This means that instead of starting out a routine with bench pressing, start it out with a triceps exercise. If you bring the most intensity to the gym on Monday, then start your Monday workout by training triceps. It is a common-sense approach to training, yet most people never realize its importance. It's important! Do this with an EZ-curl bar with your grip shoulder-width apart. Lie flat on a bench with your head at the edge of the bench. Let the bar go below the parallel plane of bench until you feel a good stretch in your triceps and then fire the bar back up to the top of the movement. Don't be afraid to let the bar go way below your head. Make sure that you keep your arms from flaring out wide during this movement. If done properly, this exercise is the absolute best for building strong triceps and should be included as much as possible in a workout plan. The stretch at the bottom is the key to why this movement is so effective. This stretching of the triceps promotes hyperplasia. Hyperplasia can essentially be described as the dividing of cells in a given organ or tissue beyond what is considered normal. This is (in this case) due to a great demand. This demand is created because the stretching of the triceps combined with the added stress of the concentric (positive) phase of the movement absolutely rips the triceps to shreds. Triceps movements that involve stretching the muscle during the eccentric (negative) phase should always take preference over every other triceps exercise. The main reason why most people don't achieve the results that they seek in the gym is because of the lack of intensity on their part. Either their training program is not geared towards intensity or they simply don't have the mental edge that is necessary when trying to bulk up. In order for a program to be geared toward intensity, it better include a lot of heavy lifting. Muscles don't respond to light and casual training. Light and casual training may be easy for you to perform, but that kind of training is also easy for your muscles as well, which will leave you with a pair of tiny little arms to show for it. Building muscle is your body's absolute last priority because it takes a lot of energy to maintain. Building muscle is actually a survival mechanism to help the body maintain its overall equilibrium. When you perform an extremely strenuous workout, your body will in turn make the necessary adjustments to make sure that the next workout is more manageable. For some reason, people seem to have it in their head that their body wants to work with them to build muscle. There is this notion out there that says that you can just walk into a gym, pick up some weights and your body will take care of the rest. NOT TRUE! The truth is that you have to beat your body into submission through heavy lifting to get the results you want. There is no other way around it. In order to perform optimally with heavy weights, a certain level of mental intensity is required. I have heard many ways to describe mental intensity; however, the best description was verbalized during a documentary on WWE Superstar John Cena. During this documentary, the gym owner of the gym that Cena had originally trained at described true intensity as "borderline insanity". Does this mindset match up with your style of training? Chances are that there is room for improvement. If you are wondering if your intensity is up to par, then ask yourself one question. When you are lifting, does everyone within a 50-foot radius know it? People's heads should turn when you are lifting, and every girl in the gym should think you are crazy. They should all hear you fighting for every last repetition. From my own personal experience, I know that my intensity is up to par when half the gym turns their heads as I finish out a set. Today, I actually got a "holy s***!" from someone spotting me after I finished a heavy set on the leg press. Half of it was because I was pressing some heavy weight, but the other half of it was because I fought for every last repetition. Mental intensity is absolutely critical for anyone serious about getting big. From a physiological standpoint, mental intensity causes the release of adrenaline via the endocrine system. It is widely known that the functioning of the endocrine system is directly affected by neurological processes in the brain. For instance, if a person gets attacked, their brain will send signals to the endocrine system to quickly release large quantities of adrenaline so the person may defend themselves against an onslaught. This rapid release of adrenaline sharpens focus, pumps more blood to the body, and amplifies strength. In extreme cases, there have been everyday humans that have lifted cars off of their loved ones who were trapped underneath. Do you see where this is going? The rapid release of adrenaline can make regular humans into super humans and when tied to weight training, it can have drastic implications for muscle development. Your brain controls your adrenaline, and you can control what happens in your brain. This is why intensity is so important. When you get yourself hyped up mentally, your body responds. You will be able lift more weight, which will translate to more mass and strength in your triceps. Intensity is a cornerstone for building titanic triceps. Progression refers to increasing the amount of weight that you are using for a given exercise over time. Progression is key because your muscles need a reason to grow. Doing the same amount of weight for the same amount of repetitions week-to-week-to-week does not lend itself to muscle growth. If your muscles are not being forced to lift heavier and heavier weight, then chances are they will not grow. Poor nutrition is generally the number one reason why people fail to build muscle. Once you leave the gym, the game is just getting started. Going to the gym only tears down your muscles. Muscle is built in the other 23 hours of the day while you eat, sleep, and recover. In order to build titanic triceps, it is absolutely critical that you consume enough protein, carbohydrates and fat so that your body has the right tools available to build muscle. There is one point that I want to drive home and that is that out of all the training aspects in this article, intensity and recovery are the most important. It really doesn't matter if the training program that you are on is the perfect training program. If you focus on intensity and nutrition, then you WILL see results. You will get stronger and you will build titanic triceps.